However cliche, if a city is known for a sandwich, it’s probably a good one. 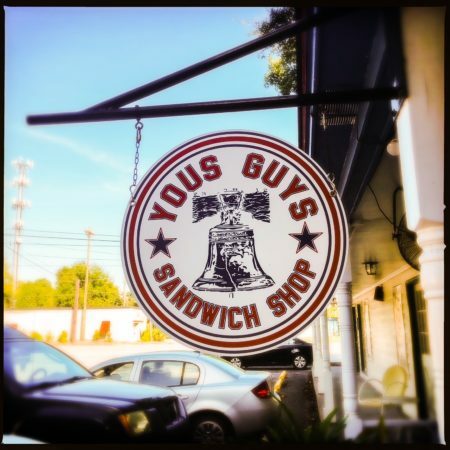 Enter Yous Guys on Folly Road, focused on sharing the love with a taste of the City of Brotherly Love. Set amongst a jeweler, a seamstress, and a Brazilian wax spa, the cozy joint is brimming with Eagles and Penn State paraphernalia. Seating is limited to some outdoor tables, although there is a single chair available at the L-shaped wooden bar inside. As Hall and Oates videos played on a flat-screen TV, I leafed through a doctored copy of the latest Dish, a picture of a cheesesteak taped over the pizza-adorned cover. With an array of Utz potato chips and giant pickles for sale, the attempt at authenticity is transparent … until it’s cheesesteak ordering time. Having grown up about an hour outside Philadelphia — although admittedly, in the Amish-strewn burbs — I learned the Soup Nazi-esque ordering procedure young. The options are limited and the rules basic: You have your choice of three cheeses — white American, provolone, and Cheez Whiz — and the option of grilled onions. If you want onions, you say “with.” If you don’t, you say “without.” So “Whiz With,” or “American Without.” Got it? Forget it, because at Yous Guys there is one choice only, sharp provolone. Why? Go figure, although a clue potentially lies in the presence of the Italian roast pork ($11). 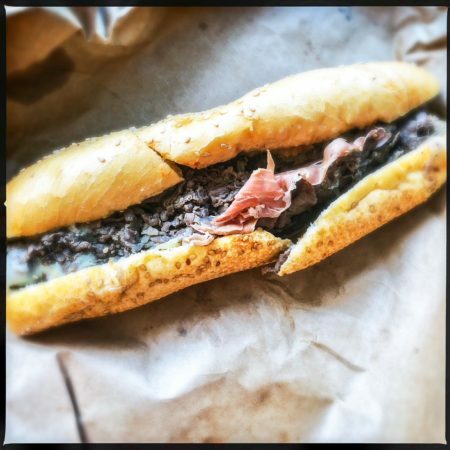 Rivaling the much-better-known cheesesteak and Italian hoagies for Philly Sandwich Supremacy, this unsung hero traditionally features a long Italian roll filled with shaved, slow-roasted pork and topped with melted sharp provolone and garlicky, sautéed broccoli rabe. Perhaps due to it’s lesser-known status, it doesn’t get ordered all that much and that’s why they were out a critical ingredient? Twice. Alas, facing a looming deadline, my Italian roast pork was made with raw arugula in place of the rapini, which is a bummer. It’s also notable in that the sandwich was still terrific. Moist and juicy, the thin-sliced meat is in generous supply, and the provolone adds a nice buttery element. Served on a soft, seeded 12-inch roll, it’s first-rate, and presumably only better when made with the bitter, garlicky green. 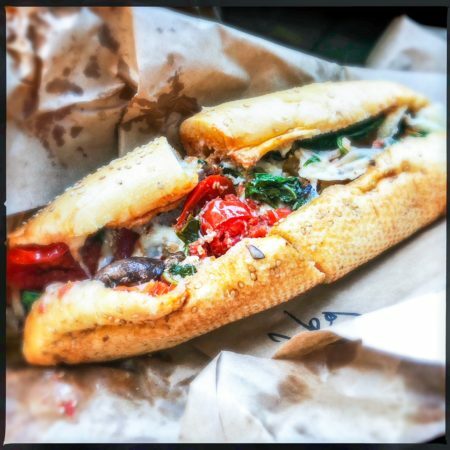 Playing the part of the problem child, the hot veggie ($10) is described as a mix of eggplant, mushrooms, and broccoli rabe, plus onions, arugula, and cherry peppers, topped with sharp provolone cheese. IRL, the owner stated that it’s “a mix of whatever we have,” which in my case meant sliced sauteed onions, fresh tomatoes, and arugula, with a scattering of sautéed mushrooms and spicy AF cherry pepper slices on top. Dominated by paper-thin, lightly cooked onions and wilted arugula, the texture is exceedingly stringy. The generous portion of marinara sauce throughout renders the bread mush, resulting in a sandwich that’s, well, kind of gross. Womp, womp. Happily, the chicken marsala ($12) fares much better, although once again sans broccoli rabe. Personally, I would’ve sent someone down the road to Whole Foods or Harris Teeter — or at least cooked up a vat of garlicky spinach — to ensure the inclusion of a critical ingredient, but I’m also blissfully ignorant of the probable stresses of running a mom and pop-style sandwich shop. Nevertheless, the chopped chicken, cooked in Marsala wine, is moist and flavorful, and the sauteed mushrooms are a bonus. 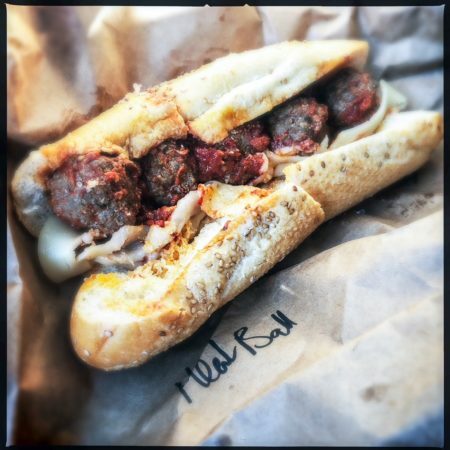 Topped with the ubiquitous sharp provolone, it’s one of the better hoagies sampled. The star of the show and the likely reason one heads to Yous Guys is no doubt the classic cheesesteak ($10). 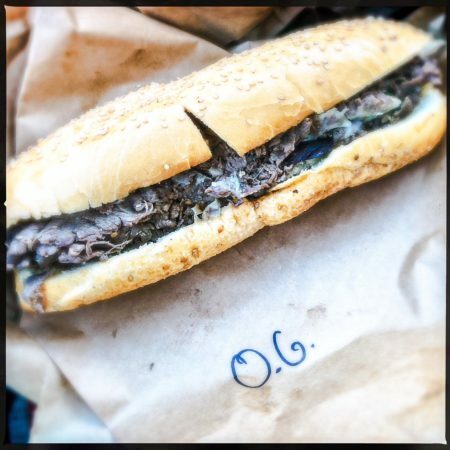 Filled with tons of shaved beef ribeye and layered with paper-thin sauteed onions and provolone, this O.G. is like a Mummers Parade in your mouth. Truth be told, and despite being raised by a man who keeps Cheez Whiz at the ready, my preference is “American with,” and it’d be swell if those guys would start offering all three. Still, when an authentic taste of Philly beckons, this is about as close as one gets south of the Mason-Dixon. Nick Foles and his lone, $2 slice of prosciutto. I don’t know who Nick Foles is or where he gets off charging $2 for two slices of prosciutto, but c’mon already. The Nick Foles cheesesteak ($12) is the exact sandwich described above, but with two wispy pieces of prosciutto on top. Do what you will with your George Washingtons, but consider getting it on the side if you hope to taste it at all. 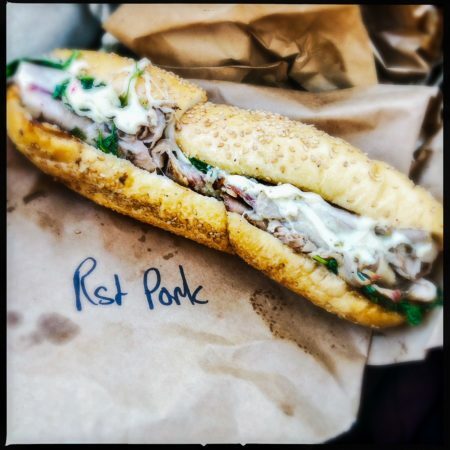 A take out sandwich shop just trying to make its way in this crazy world, Yous Guys does a bang-up job in the cheesesteak department, with the added bonus of bringing the little-known Italian roast pork option to the area. Come for the hoagies and stay for the classic ’80s videos, just be prepared to potentially have to B.Y.O. broccoli rabe.